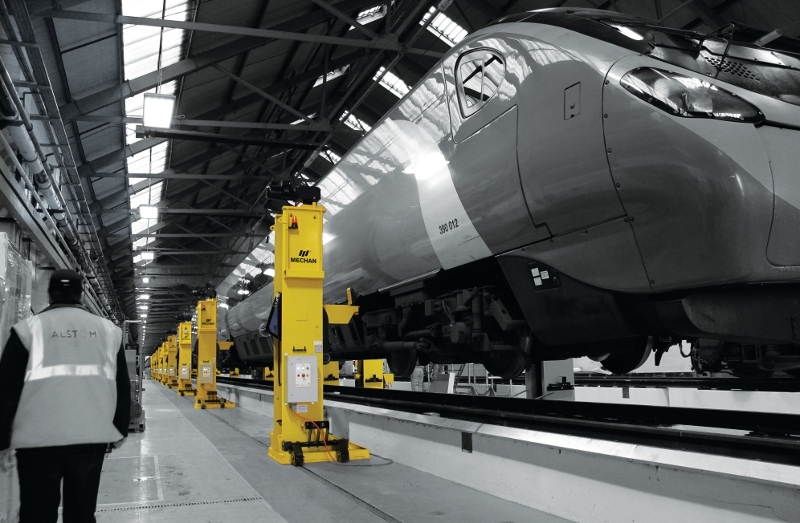 The Alstom Transport Traincare Centre in Longsight, near Manchester, boasts the longest single system of lifting jacks in the UK – the largest we have produced to date.The 44-jack chain was commissioned to service the new 11 car Alstom-built Pendolino trains introduced on the West Coast Mainline. We saw off competition from Europe and China to secure this prestigious contract, which involved designing a completely new version of our Megalink controller to accommodate such a large number of jacks. We also had to create a taller version of our standard jack to enable the system to operate within the practical constraints of the depot. Installation of the jacks was completed on time and within budget. To accomplish such a notable ‘first’ for the UK rail industry was a massive achievement and it increased global interest in our products. The project marked a significant step forward for Megalink and consequentially, the application of our jacks. It took seven months to develop software that would lift such a large network without losing the flexibility and synchronicity for which the system is renowned and we were very pleased with the results.